Lattes, Lipstick & Literature: Coffee and Books! While not a Lipstick, Lattes and Literature post I just wanted to review what I drank along with the only book that I have been able to actually read this month (too bad it's sort of mandatory for school). Sunday I made blended coffees because that was the type of day it was. Considering the sunny weather we have been having it was so good. I decided to use my Java Shot that I got in my Blue Spider Press April Box. Surprisingly the flavoring did not really stand out too much to, I was incredibly shocked as I was expecting a bit of a chocolate flavor, but sadly this did not deliver. The book I've been reading however is really interesting, considering that I am an Anthropology major at school it really interests me. 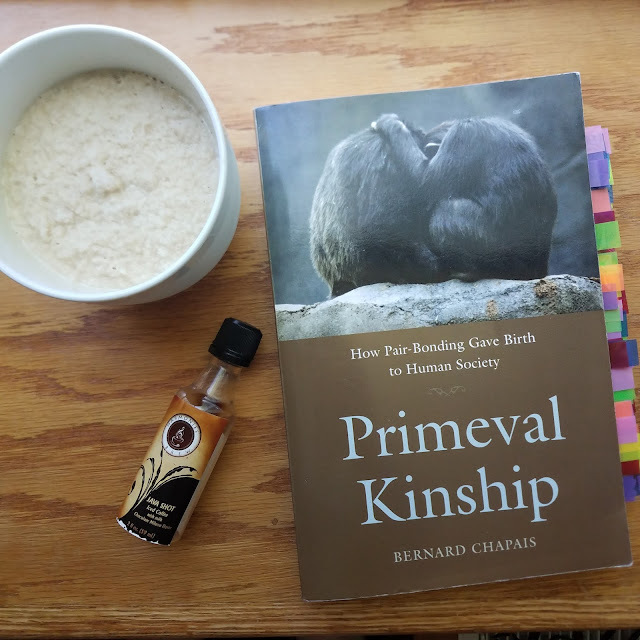 It is about Kinship and considers the phylogeny of kinship and descent in primates. Since it is for school I have marked the important points for chapters I've read... it's pretty much the whole book as you can tell. I will not be doing a review on this book, as I've written 4 essays (soon to be 5) on this book and I really don't want to write anything else in depth on it. What have you been reading and drinking?